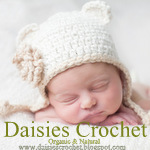 Daisies Crochet: HELLO KITTY earflap hat. 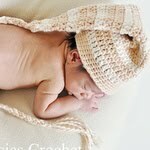 Crochet pdf Pattern included 6 sizes from newborn to preteen. I use soft, 100% organic cotton grown and spun without the use of pesticides, herbicides or other chemicals. But you can use any other blend of similar yardage yarn. 20 pages, a lot of step by step photos. Lion Brand Nature’s Choice Organic Cotton (103yd/94m – 3oz/85g) Aran/10ply(8wpi) or any other blend of similar yardage yarn. Need knowledge of: ch - chain, s - single crochet, dc - double crochet, tr - treble crochet, sl st - slip stitch, picot, increase, decrease, work in rounds. ***This pattern has been tested 2 times by different crocheters. However, please contact me if you have ANY questions. I will happily provide email support for any of my patterns. •You cannot copy, resell, share, or forward this pattern. No part of this work may be reproduced transmitted or published in any form or means without prior written permission from Daisies Crochet.